Software Cinema: Evri : Yet Another Semantic Search Engine ? ...... And, even with great semantically-aware data, it’s all about the UI. 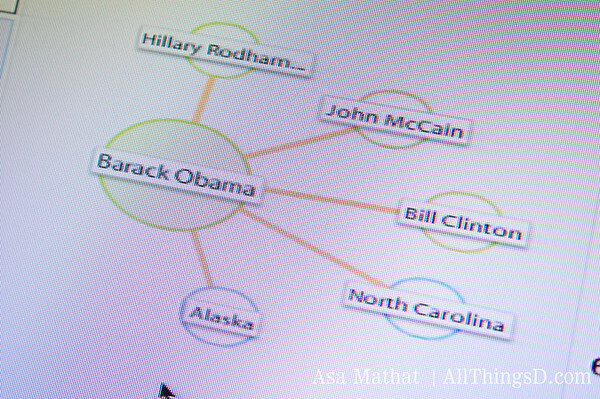 Evri is building a “data graph” that shows interesting and useful connections to explore about things in the outside world-things that aren’t part of your social graph. 我覺得 Evri 光明正大的提到 UI 是件很好的事情 ( 這個 UI 讓我很想試用看看阿 ). 利用 Semantic Web 的 Content-based Search Engine 在這一兩年陸陸續續地出現, 但是有哪個真正吸引了大眾的目光, 有哪個真的足以威脅到 Big Three Search Engine : Google, MS Live Search, Yahoo 的佔有率 ? 以 Business 的角度來說, 或許像 Evri 開始改用 User 的角度來思考, 希望透過更好更易懂的 User Interface 來包裝 Semantic Web 會是一個不錯的嘗試. 不用想要去教會 User 什麼是 Semantic Web, 因為 Semantic Web 本來就存在我們的腦袋跟生活裡, 而是透過 UI Languages, 讓 User 很容易地在 Computer System 上操作 Semantic Web, 補足缺少的資訊區塊. 回頭來看 Evri 的標語 : Search Less, Understand More. This entry was posted on 上午8:15 and is filed under data and knowledge engineering , software company , web engineering . You can follow any responses to this entry through the RSS 2.0 feed. You can leave a response, or trackback from your own site.